The Brew Lounge: Victory Beer Dinner at Anthony's Coal Fired Pizza in Horsham, Pa. Victory Beer Dinner at Anthony's Coal Fired Pizza in Horsham, Pa. It's about time to get caught up around here, would you agree? Let's start with Victory Brewing Company and Anthony's Coal Fired Pizza. A few weeks back, they invited me out to their Horsham, Pa. location, one of 34 across the northeast and southeast parts of the country. This was (selfishly-speaking) fortuitous for my wife and I as we've been looking for an opportunity to check out the appealing menu of foods, mostly all prepared by way of the coal-fired oven in the kitchen. On September 20, the restaurant hosted Victory and its sales representative Adam Gladish as a way to highlight their support of craft beer. In fact, their tap list prior to the dinner boasted a well-varied spectrum of offerings from River Horse to Victory to Stoudt's and others. The dinner was kicked off by store manager, Preston Russell, and Gladish who walked the roughly 25 attendees through the four courses of well-conceived plates of food and Victory beers. Anthony's took the approach — which I think is a great approach; similar to a brewery that takes an off-the-shelf beer as a submission to GABF — of basing the four courses around existing regular menu items. All menu items for this special dinner are available as regular menu items on any other day. As first-timers, this made a great introduction for us. Roasted pork ribs and Meatballs with fresh ricotta....crispy oven-baked wings...salads....and, of course, pizza were paired respectively with Victory's HopDevil, Festbier (seasonal), Headwaters Pale Ale, and Prima Pils. To pick a favorite course would be tough, even in hindsight. The huge and perfectly prepared meatballs were made even more perfect with a dollop of fresh ricotta. The charred chicken wings were some of the best I've ever had, as were the charred and tender pork ribs. Salads were more than just your run-of-the-mill salads; one a tomato and fresh mozzarella and the other a traditional Italian. But, the pizzas; oh my, the pizzas. Have you ever had cauliflower on your pizza? Coal-oven fired cauliflower? Before you turn it away, try it. Tell me it doesn't throw you for a loop...in a good way, of course. And the fresh mozzarella and tomato pie was equally pleasing. All of this for a very reasonable $30. 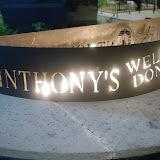 The menu concept at Anthony's is relatively simple and straightforward. Yet, filled with so much to please and fill you. If you missed this dinner and would like to experience it for yourself, the Wayne, Pa. (Delaware County) location will be hosting the new Neshaminy Creek Brewing Company in November for a similarly-styled beer dinner. More details will be forthcoming. BONUS: As a parting gift, stay tuned next week for an Anthony's Coal Fired Pizza gift card giveaway right here at The Brew Lounge. Coal-oven fired cauliflower? Well, no.